Dashboards are our expertise here at Plecto. We have been helping businesses create engaging and inspiring dashboards that give them a complete overview of their KPIs since 2012. Over the past six years, we have learnt what constitutes a well-designed dashboard and have gathered a fair few tips and tricks along the way! Whether you're new to Plecto, or an existing user, keep reading to discover our 'golden rules' of dashboard design. Your dashboard should be designed in such a way that data can be understood at first glance. This means that your dashboard shouldn’t be cluttered with too many widgets and too much text. Large text is useful as it makes clear what you are trying to visualize on the dashboard and also makes it easier and quicker to understand. Text size can also be used to indicate importance on your dashboard. When you make important information larger, people's eyes are first drawn to the most important figures when they see the dashboard. Being able to see your key metrics and KPIs instantly is fundamental to create a truly useful dashboard. Try to avoid cramming multiple widgets onto one dashboard as it begins to look too cluttered. You should also leave space between widgets to make it clear where one widget ends and one begins. You can always split widgets across different dashboards and then display the dashboards as a slideshow on your TV screens to make it more manageable and spread out. 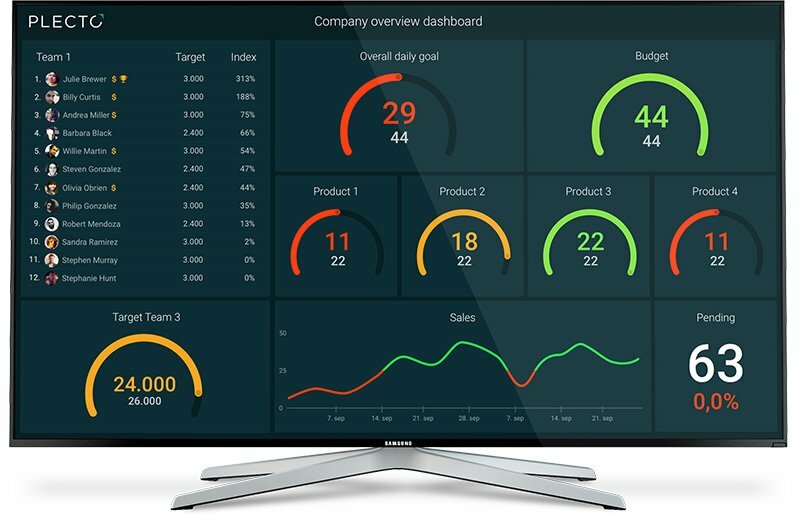 Widgets should also be large enough so that the data can be read easily; this is particularly true if you display your dashboards on TV screens which are read from a distance. Widget size is particularly important to bear in mind if you are using charts on your dashboard as if they are too squeezed they will become impossible to understand. Columns are a handy way to compare data, or to provide context to data. 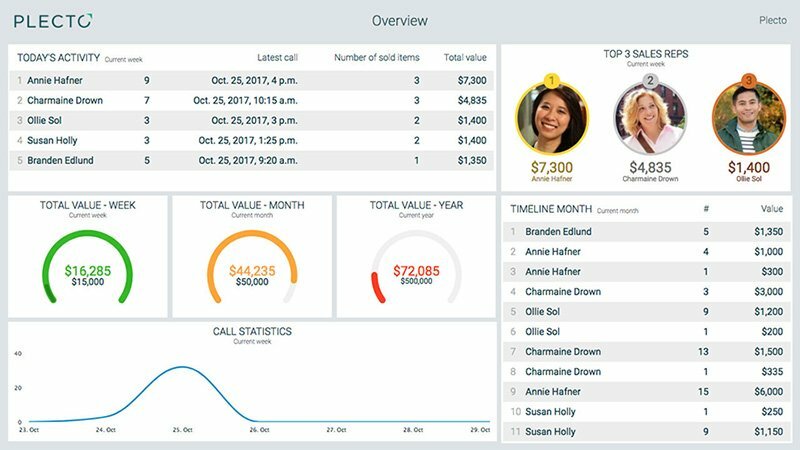 For example, you could display how many calls a sales team member has made and next to it you could show how many meetings they have booked. This will help give you a better overview of your data and make it meaningful. When using a table widget, you should avoid using too many columns as the data can become confusing to read and understand. One way to do this is to simply show a percentage of completed tasks for the day for each team member. This eliminates the need to list their individual tasks and reduces the risk of your dashboard becoming overcrowded. Although we have preached keeping it simple, using a variety of widgets on the same dashboard can actually make your dashboard easier to understand. This is because different widgets are good at displaying different things, so you may need to combine a few on the same dashboard to get a perfect visualization. Plecto offers a number of different widgets including speedometers, line charts and number widgets. The choice of widget you should use depends on the kind of data you are displaying and the space you have available on your dashboard. For example, speedometers are good at visualizing goals and progress, line charts are good to compare data from previous periods and number widgets are good at showing simple information such as the number of calls made. Another way to keep your dashboard exciting but simple at the same time is to visualize the same KPI across different widgets. A great example of this is to have a speedometer showing revenue growth compared to your revenue growth goal, and then in a table widget show how each employee has contributed towards this goal. Try not to use too many colors on your dashboards as things can get a little confusing, especially when people are unsure what different colors represent. One great way to incorporate color into your dashboards is by using conditional colors. Using Plecto, you can assign red, orange and green colors to your numbers depending on whether KPIs are being met or not. For example, if you are not hitting a KPI, you can display this number in a number widget in red. Conditional colors can be applied to both text and also the background of the widget box. When it comes to background colors, we recommend keeping things simple and plain so that your numbers and widgets stand out. Plecto comes with default color schemes, but if you have the large package you can also add your own custom company colors to create a personalized business theme. Using images on your dashboard can help break up a concentration of text-based widgets. If your company is international, one fun way to use images on a dashboard is to place a world, continent or country map on the dashboard then place other widgets on top to indicate activity in different locations or company offices. Gamification is guaranteed to make your dashboards more exciting, and also at the same time engage and motivate your employees. Gamification is a feature that is unique to Plecto dashboards and is something we are really passionate about. One way to use gamification on your Plecto dashboard is by adding a leaderboard. You can also set up custom notifications that are triggered when a team member reaches a goal, like making a sale or getting a good customer support rating. You can also award them a virtual badge that is displayed next to their name. In addition to this, employees can also set up a custom YouTube video to play when they achieve a goal and activate a notification trigger. It is human instinct to look at the top left of a screen first – it is where we have been taught to begin reading from. Therefore, it is good practice to design your dashboards in such a way that the most important information is at the top left and then work your way across and down. Of course, if you are from a country where text is read right to left, then design it like that. Readability is key. If you are using two different widgets to compare similar, or related data, then make sure they're placed next to each other. This may sound obvious but when designing dashboards, many people forget that the end users will not have the same understanding that they do of how the widgets relate to each other. We hope this post has given you some inspiration for designing and creating effective and inspiring dashboards! At Plecto, we want your dashboards to help you better visualize your KPIs, whilst engaging and motivating your team. If you want to create dashboards that do exactly this but are a little unsure about where to begin, sign up for your 14-day free trial of Plecto and book in for a demo with one of our experts who will help get you started. Just enter your email address below! Want to know more about employee engagement and motivation?